We're Helping Get Nebraska On Track! All ProRail Nebraska members are invited to attend. If you can't attend in person, a conference phone line may be available. Location: Omaha Metro Transit/MAPA Headquarters, 2222 Cuming St.
Click here to view a PDF copy of the newsletter. in common cause for a clean energy future. Could railroads, the oldest form of mechanized mass transportation, be the key to unlocking solutions to some of the greatest challenges of the 21st century? Unique among modes of long-haul transport, rail can be electrified. So, why not power trains with renewable energy? Might a clean, modernized, higher-speed rail network draw freight and passengers off the highways and back onto the tracks? Could electrifying the railroads actually open new transmission corridors and increase the supply and reliability of electricity from wind and solar? If the rest of the world is already electrifying their railroads, why isn't the US? Video, info, and book purchase at www.solutionaryrail.org. Please join us on May 3rd for this presentation and discussion! Hosted by Nebraska Sierra Club. Click here to view PDF flyer for the event. ProRail Nebraska supports LB492 and thanks Senator Wayne for introducing this bill as a follow-up to the hearings on LR399 held last year. On April 18 the Urban Affairs Committee voted this bill out of committee to General File. It is one of the Committee's priority bills. ProRail believes that improved transit services in Nebraska metropolitan areas will make them less car-centric, encourage higher-density energy-efficient development, make our cities more attractive to young skilled workers who want to avoid car-dependent lifestyles, and improve the environment by reducing greenhouse gas emissions. LB492 would allow municipalities to create regional metropolitan transit authorities (RMTAs) within the boundaries of a MSA (Metropolitan Statistical Area). Existing transit agencies like Omaha Metro could choose to become RMTAs. The service areas Omaha Metro and Lincoln's StarTran are limited to the boundaries of their respective cities. Several surrounding communities like La Vista and Papillion contract with Omaha Metro for limited weekday rush-hour services. But these municipalities cannot join Omaha Metro under the existing Metropolitan Transit Authority Law. Omaha Metro operations are primarily funded by property tax revenue from taxable property in the City of Omaha. Farebox revenue covers only about 15% of operating expenses. If LB492 is enacted and Omaha Metro chooses to become a Regional Metropolitan Transit Authority, any Nebraska municipality within the Omaha MSA could, upon a two-thirds favorable vote of the municipality's governing body, join the RMTA of Omaha. The RMTA would benefit from the increased property tax revenue from the new member's taxable property. Thus this Act provides a mechanism to expand both the transit authority's territory and property tax revenue. Another nice feature of LB492 is that it requires that RMTAs be governed by an elected, not appointed, seven-member Board. This has the potential of making Board members more responsive to the needs and concerns of the public. A limitation of LB492 is it doesn't provide any new sources of income. RMTAs would still be primarily dependent on property tax income. Some transit agencies, like Kansas City, are also funded by sales tax revenue and business district assessments. Remember, good transit benefits everyone, even those who never ride it! The Rail Passengers Association has released 2018 Amtrak fact sheets by states, stations, business lines, routes, and congressional districts. Click here to view the 2018 Fact Sheet for the California Zephyr route. Click here to select other fact sheets. The Rail Passengers Association held their 2018 Fall Advocacy Summit in Miami, Florida from October 19-21. The location was selected to provide the attendees the opportunity to experience the new Brightline passenger service firsthand. I would like to have traveled by Amtrak, but that would have entailed a combination of the California Zephyr from Omaha to Chicago, the Capitol Limited from Chicago to Washington, D.C., and either the Silver Meteor or Silver Star from Washington to Miami, a trip consuming 60+ hours each way, and I had commitments at home that would not allow me to be gone that long. The chance of all three trains making connections on time was also an issue, as was the substitution of boxed meals for dining car service on the Capitol Limited. 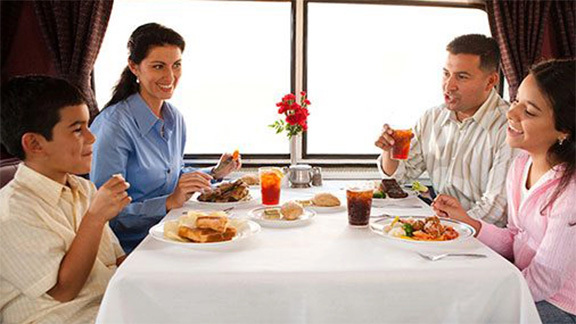 One of the true pleasures of train travel is the opportunity to socialize with other travelers, and the dining car is the best place to enjoy that. Click here to read Jim's full report (PDF). The failure of the Legislature to pass to restore Nebraska's membership in the Midwest Interstate Passenger Rail Compact (MIPRC) results in the state losing its voice on passenger rail matters. Nebraska was a charter member of the compact until former state Sen. Bill Kintner's bill succeeded in terminating Nebraska's participation because he couldn't see how the state benefited from its membership. But Nebraska now has a chance to regain its say. Grand Island Sen. Dan Quick has introduced LB401, which would return Nebraska to the MIPRC -- and 10 senators have cosigned onto his legislation. 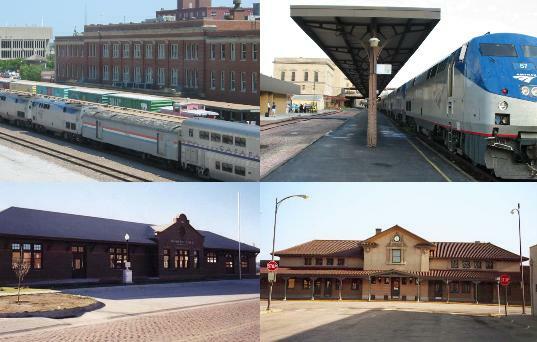 MIPRC was formed to provide central planning for passenger rail service in 10 Midwestern states. It also serves as a collective for rail passenger trains and lobbies on behalf of adequate funding for Amtrak. This proposed rail service would be in addition to the long-distance California Zephyr trains currently running through Nebraska at night. The plan is to run passenger trains out of a Chicago hub in multiple directions to major cities. Several of these lines are already in operation. A line from Chicago to Omaha was planned, and it would be easy to extend this service to Lincoln. With Nebraska falling out, it's possible that the trains through Illinois and Iowa will terminate in Council Bluffs, which would be inconvenient for Nebraska residents. Nebraskans want passenger trains. A statewide poll conducted by the University of Nebraska-Lincoln's Bureau of Sociological Research showed that a majority of citizens support funding for Amtrak, want rail commuter service between Lincoln and Omaha and desire to see more and better rail passenger service in Nebraska. However, getting Nebraskans to put passenger rail on their radar scope is difficult. Unless they have gone out of state and experienced good, frequent rail service or ridden Amtrak, they are unaware of its potential. Now that Nebraska has a Department of Transportation rather than a Department of Roads -- under which rail planning suffered -- it would be refreshing to see the department look at rail passenger possibilities rather than expend all its energies in designing four-lane expressways. I see a change at Nebraska DOT and a start at meaningful rail planning. Quick's LB401 will restore Nebraska's membership in MIPRC, and it is hoped that the Legislature will see the wisdom of rejoining and continuing in the compact. We don't have a currently rail passenger plan in Nebraska, and, as a result, federal taxes in Nebraska are sent to other states -- and Nebraska receives no federal rail passenger funding. Therefore, we hope Gov. Pete Ricketts will get on board this train and direct the DOT to bring the state's rail passenger planning up to date. While most other states have moved forward in the area of passenger and commuter rail, Nebraska has done little to nothing. The state needs to wake up and catch up. If we don't continue in the MIPRC, our chances for federal rail passenger funding are slim to none. On January 17th ProRail Nebraska ally Senator Dan Quick (35-Grand Island) introduced legislation that would enable Nebraska to rejoin the Midwest Interstate Passenger Rail Compact. LB 401 had 10 co-sponsors: Kate Bolz (29-Lincoln), Machaela Cavanaugh (6-Omaha), Ben Hansen (26-Lincoln), Sara Howard (9-Omaha), Megan Hunt (8-Omaha), Mike McDonnell (5-Omaha), Adam Morfeld (46-Lincoln), Patty Pansing Brooks (28-Lincoln), Lynne Walz (15-Fremont), and Anna Wishart (27-Lincoln). In addition to having Nebraska rejoin the MIPRC, the bill establishes the Midwest Interstate Passenger Rail Compact Cash Fund. In addition to money appropriated by the Legislature, the fund could accept gifts, grants, or bequests from any source, including federal, state, public, and private sources. State funding Nebraska's participation in the MIPRC has been an issue, and this would allow funds from other sources to be used. Annual dues for MIPRC membership is less than $25,000. There is also the travel expenses for the four Nebraska members of the Commission to attend MIPRC meetings. If you live in one of the districts listed above, please thank your senator for their support of LB401. Otherwise, encourage your senator to sign on as a cosponsor of LB401 and/or support Nebraska rejoining the MIPRC. Click here to view a PDF document list reasons why Nebraska should rejoin the MIPRC. January 18, 2019 - After months of having to endure mostly cold boxed food - what some critics dubbed "Unhappy Meals" - on two Amtrak long-distance routes, the New York-Chicago Lake Shore Limited and the Washington D.C.-Chicago Capitol Limited, sleeping car passengers on those trains now can choose from several hot food choices on the menu. 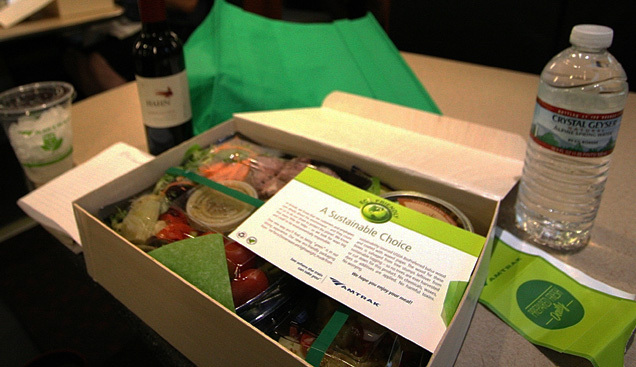 When Amtrak, under President and CEO Richard Anderson (a former airline executive whose reputation with employees and customers was, according to some accounts, less than favorable), instituted cold food in a box soon after he took office and called it "Contemporary Dining," there was a huge outcry. Apparently, the often-vocal complaining, which involved Amtrak unionized employees, worked. What Amtrak is now calling "Contemporary Dining Improvements" includes three hot entr�es and "deluxe breakfast choices," up from one hot-meal choice brought back in July 2018. Sleeping car customers can now choose the following, with meals delivered to their Bedrooms or Roomettes, "or eaten in their private dining car," Amtrak said. Lunch and Dinner hot items are Chicken Penne Alfredo, Beef Provencal and Asian Noodle Bowl (there is a chilled item, an Antipasto Plate). Deluxe Continental Breakfast hot items are Oatmeal and a Breakfast Sandwich. (Chilled items are Muffins, Yogurt, Fresh Fruit, Hard-boiled Eggs and Cereals.) Customers are also offered unlimited soft beverages, a complimentary serving of beer, wine or a mixed-drink during their trip and an amenity kit, all included in their fares. A Kosher meal is provided with advance notice and children's meals are also available. Menus for both trains are on Amtrak.com. Derrick James of Amtrak's Chicago office who is the Senior Director of Government Relations spoke at a ProRail Nebraska-sponsored event in Lincoln December 10th. The meeting was well attended and James answered a number of questions following his presentation. Amtrak is ordering 70 new locomotives to replace older diesels that are nearing the end of their service lives and probably some electrics for the Northeast Corridor. Also being ordered are Viewliner II passenger cars which are primarily used on eastern passenger trains. There are no plans currently to order Superliner double-deck equipment. James stated that the long-distance passenger trains, including the Southwest Chief, are safe for the time being. Congress sent a strong message to Amtrak that they don't want the long-distance trains discontinued. Nonetheless, James says that Amtrak thinking is that they should concentrate on trains that run between major population centers about 400 to 500 miles apart because long-distance trains are not competitive with airlines. In this respect it should be noted that 83% of the current California Zephyr riders do not go all the way from Chicago to Emeryville, CA. 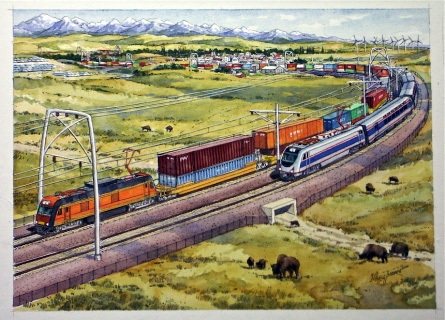 The long-distance trains thus fulfill a role of providing regional transportation on long-distance corridors -- a strong argument for keeping the long-distance trains. James noted that ridership on the California Zephyr trains continues to increase. Not mentioned was the fact that after Amtrak de-staffed a number of stations in Iowa, boardings have fallen 16% according to an article in the Des Moines Register. Overall Amtrak ridership was down a bit during 2018 which James attributes to problems with the Lakeshore Limited where trains could not be operated due to track construction along that line. James noted that Congressional support for Amtrak, including money for track upgrades, is trending upward significantly. At the same time Amtrak has been able to cut costs and the latest annual loss was $168 million, a fraction of the spending for airports and highways by the Federal government. Regarding on-time performance, James said it varied depending upon which freight railroads the Amtrak trains were operated on. Canadian Pacific has one of the best on-time records for the freight railroads and Union Pacific and BNSF also do well. Amtrak trains are at the mercy of freight railroads. Track maintenance projects delay Amtrak trains and admittedly sometimes an Amtrak train gets lower priority in movement compared to hot freight trains. James indicated that court litigation to enforce penalties for delayed Amtrak trains and having the freight railroads give priority to Amtrak is still in progress. An adverse ruling in lower court is being appealed. Regarding a question about Amtrak fares compared to flying, James stated that a comparison on any given train at any given time is difficult. Amtrak structures fares much like the airlines in that if a train is filled, the fare will be higher; but if a train is not fully booked days before departure, a lower fare will be quoted to try to fill the train. The California Zephyr trains fill early and sometimes passengers will have to pick a different departure date to secure a reservation. Mention was made of the ease of carrying bicycles on trains compared to past years. Also, dogs and cats can accompany passengers if in kennels and then only in coaches, not sleeping cars. In response to a question about WiFi being available on eastern trains but not on the California Zephyr and other trains further west, James said Amtrak is working to add WiFi capability to these trains. While on his trip James has met with local officials in Omaha and Lincoln and the mayors of Hastings, Holdrege and McCook to build support for Amtrak. 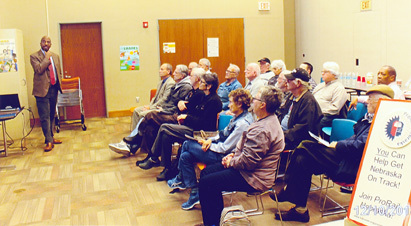 Lincoln City Councilman Bennie Shobe attended the December 10th meeting at Gere Library. James stated that the plan to extend the Heartland Flyer from Oklahoma City to Kansas City is very much a possibility. In response to a question from me about the possibility of a second pair of Chicago to Denver trains through Nebraska during daylight hours, James stated that any expansion of Amtrak service would depend upon the support of a state or states. He cited Missouri and Illinois as states where trains partially supported by state funds are being operated. One of our guest speakers at the ProRail Nebraska meeting this morning in Lincoln was Michael Davis, Transit Manager for the City of Lincoln's StarTran. Although StarTran doesn't have wifi installed on its buses yet, it already has several innovations we can only dream of in Omaha. Click here for details. The new StarTran Get On Board System allows you to track the location of your bus on a map, get an estimated arrival time, and set up alerts using StarTran's AVL website. Also, you can download bus passes on your smart phone and pay your fare onboard using the Token Transit ap. StarTran has increased its order for electric buses from 2 to 4 thanks to a grant from the VW Mitigation Settlement Fund. The buses, which were ordered from New Flyer, are scheduled to be delivered next Fall. Click here to view an informative StarTran Fact Sheet. StarTran's criteria for placing a bench at a bus stop is a minimum of 15 passengers per day. A bus shelter must have at least 25 passengers/day, and several additional shelters will be installed next Spring. Many bus stops have trash cans, and StarTrans has a contractor that empties them and cleans up litter around the stops. Omaha has to rely on volunteers to clean up litter around bus stops. Richard Schmeling with CFIT (Citizens for Improved Transit) also made a brief presentation. They are about to launch a program of giving free bus passes to needy Lincoln Public Schools students. 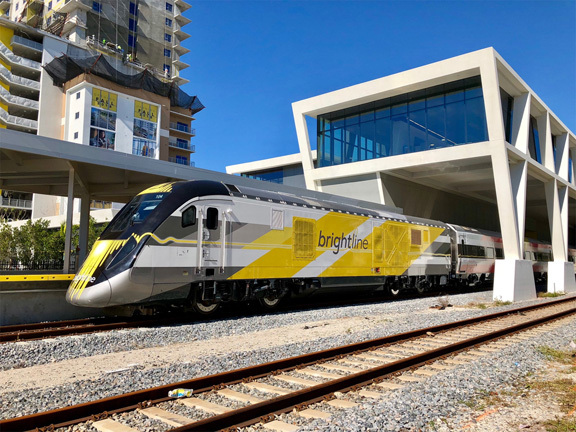 Brightline has turned passenger rail in the United States upside down by doing one seemingly obvious thing: defining what it wanted to do - its ideal scenario - then finding a way to make that happen. Too often, efforts to begin or expand passenger rail in the U.S. get off on the wrong foot by first outlining what isn't possible. Once all the constraints and barriers are in place, you're not left many options, and certainly not great ones. Brightline, instead, started with its advantages, like an existing rail corridor, and real estate development possibilities. It then set out goals, like frequent service on modern trains, and did what was necessary to make it happen. In some cases, they weren't sure how they were going to achieve their goals, but they proceeded with confidence nonetheless. Brightline began service with many trains every day, which is crucial. Often, new services plan to start with only one or two trips a day, hoping to scale up in the future. Instead, they see underwhelming ridership as a result of the limited schedule. Brightline understands that the convenience of a frequent schedule is a major part of the "will I take the train?" equation. Proving that point, I noticed that even mid-day, off-peak trains were busy. Click here to read full article and view photos. Join or donate to the Midwest High Speed Rail Association today! ProRail requested UNL's Bureau of Business Research to add four passenger rail-related questions to its Nebraska Annual Social Indicator Survey (NASIS) which was conducted last Fall. Responses to the four questions were favorable indicating a strong support for rail passenger service by Nebraska residents. Click here to view the summary. Results will be available for use in our legislative work in the 2017 Unicameral Session. Transportation for America is a coalition seeking to align our national, state, and local transportation policies with an array of issues like economic opportunity, climate change, energy security, health, housing and community development. N.A.R.P. is a member of this coalition. ProRail Nebraska advocates safe, environmentally-friendly, fuel efficient, affordable, comfortable, and all-weather mobility that rail transportation can provide. Trains provide more mobility and travel choices, especially in the post-2001 travel environment. A wisely developed train network has great potential to accommodate future travel demand. Trains are energy-efficient -- Intercity (Amtrak) trains are far more efficient than airlines (2441 Btu's per passenger-mile vs. 3999 for airlines in 1998, according to the Oak Ridge National Laboratory). Increased use of trains reduces America's dependence on foreign oil. Trains are safe, especially in bad weather. Trains contribute to development which is more compact and less wasteful than auto-oriented development. Trains pollute less than other modes of transportation. ALL ABOARD FOR PRORAIL NEBRASKA!